Chinese ceramics or Chinese porcelain is a form of fine art developed in China during the dynastic periods. China has always been richly endowed with the raw materials needed for making ceramics. Chinese Ceramics range from construction materials such as bricks and tiles to hand-built pottery vessels fired in bonfires or kilns to the sophisticated porcelain wares made for the imperial court. The first types of pottery were made about 11,000 years ago, during the Paleolithic era. Porcelain is usually green-fired or once-fired, which means that the body and the glaze are fired together. After the body of a piece is formed and finished, it is dried, coated with a glaze, dried again and fired at very high temperatures which cause the material to vitrify. The earliest porcelain was produced during the Eastern Han Dynasty (100 to 200 C.E.). A number of techniques were developed and refined during the Tang Dynasty (618 to 906 C.E. 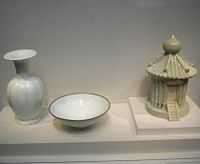 ), but porcelain-making reached its height during the Song Dynasty, when some of the most treasured pieces were produced. During the Ming Dynasty (1368 – 1644) Jingdezhen became a center for large-scale production of porcelain, both for domestic use and for export. Porcelain production in Jingdezhen became highly specialized, with teams of workers assigned to each aspect of production, and large kilns were built on the hillsides around the city, where thousands of pieces could be fired at once. During the late Ming and Qing Dynasties, bright colors including deep red, ruby, jade green, bright yellow and peacock blue came into use, and techniques for underglaze painting were perfected. Enamel glazes, glazes over carved coatings, and combinations of painting and carving were used. Qing Dynasty artisans developed new colors such as famille rose and famille verte, which were sued to create a three-dimensional appearance. Chinese artisans have always borrowed openly from previous styles, but there has also been a historical tradition of reproductions and forgeries made to look like earlier pieces. The Chinese term for porcelain (Chinese: 瓷, cí) covers a wide range of high-fired ceramics, some of which may not be recognized as porcelain by Western definitions. Porcelain is usually green-fired or once-fired, which means that the body and the glaze are fired together. After the body of a piece is formed and finished, it is dried, coated with a glaze, dried again and fired. In the high temperature of the kiln the body and the glaze are fused together to become a unit. Chinese enamelled wares are also produced in this way, except that enamels are added after the first high-temperature firing. The pieces are then fired again in a second round via a smaller, lower-temperature kiln. A qingbai porcelain vase, bowl, and model of a granary with transparent blue-toned glaze, from the period of the Song Dynasty (960-1279 C.E.). In Western tradition, ceramics are often grouped into three main categories, earthenware, stoneware and porcelain. The Chinese tradition recognizes only two primary categories of ceramics, high-fired [cí 瓷] and low-fired [táo 匋] . The oldest Chinese dictionaries define porcelain [cí 瓷] as "fine, compact pottery" [táo 匋] . In the West the property of translucence is often regarded as a defining feature of porcelain, but this is not the case in China, where any thick or opaque piece that rings with a reasonably clear note on being struck would be regarded as porcelain [cí 瓷] . Chinese ceramic wares are also classified as being either northern or southern. Present-day China comprises two separate and geologically different land masses, brought together by the action of continental drift and forming a junction that lies between the Yellow river and the Yangtze River. The contrasting geology of the north and south led to differences in the raw materials available for making ceramics, and consequent differences in the ceramics produced in each region. Chinese porcelain is mainly made using China clay (gaoling or kaolin), composed largely of the clay mineral kaolinite, and Chinese porcelain stone, also generically known as petunse, a micaceous rock containing sericite and other minerals including quartz Both derive from the weathering and decomposition of granitic rocks, and used alone or in combination. Both materials are composed of platy minerals, consisting of small platelets that ultimately allow the material to hold large amounts of water. This is important as various methods used for forming the body parts depend on the application of compression to align the platelets. One example is throwing on a wheel to increase the plasticity and workability of the clay body. In the context of Chinese ceramics the term porcelain lacks a universally accepted definition. This in turn has led to confusion about when the first Chinese porcelain was made. Claims have been made for the late Eastern Han period (100 to 200 C.E. ), the Three Kingdoms period (220 to 280 C.E. ), the Six Dynasties period (220 to 589 C.E. ), and the Tang Dynasty (618 to 906 C.E.). Fragments of pottery vessels dating from around the year 9000 B.C.E. found at the Xianrendong (Spirit Cave) site, Wannian County, in the province of Jiangxi represent some of the earliest known Chinese ceramics. The wares were hand-made by coiling and fired in bonfires. Decorations include impressed cord marks, and features produced by stamping and by piercing. The Xianrendong site was occupied from about 9000 B.C.E. to about 4000 B.C.E. During this period two types of pottery were made. The first consisted of coarse-bodied wares possibly intended for everyday use. The second, finer, thinner-bodied wares, were possibly intended for ritual use or special occasions. There is archaeological evidence suggesting that both types of wares were produced at the same time at some point. Some experts believe the first true porcelain was made in the province of Zhejiang during the Eastern Han period. Chinese experts emphasize the presence of a significant proportion of porcelain-building minerals (china clay, porcelain stone or a combination of both) as an important factor in defining porcelain. Archaeologists have found true Chinese porcelain dating back to the first century C.E. The earliest porcelain was painted with glossy, vitreous blue glaze and made a ringing sound when struck. During the Eastern Han Dynasty (25 – 220 C.E. ), the use of porcelain spread widely and replaced bronzeware and lacquerware for many uses. Estimated firing temperature for shards recovered from archaeological Eastern Han kiln sites ranged from 1260 to 1300°C. As far back as 1000 B.C.E., the so-called "Porcelaneous wares" or "proto-porcelain wares" were made using at least some kaolin fired at high temperatures. The dividing the line between the two and true porcelain wares is not a clear one. A white bisque protecting glaze was developed during the Sui Dynasty (581 – 618) and during the Tang Dynasty, new techniques for decorating with bright colors by painting, stamping, and mold printing. During the Sui and Tang periods (581 to 906) a wide range of ceramics, low-fired and high-fired, were produced. These included the well-known Tang lead-glazed sancai (three-color) wares, the high-firing, lime-glazed Yue celadon wares and low-fired wares from Changsha. In northern China, high-fired, translucent porcelains were made at kilns in the provinces of Henan and Hebei. "They have in China a very fine clay with which they make vases which are as transparent as glass; water is seen through them. The vases are made of clay" . The Arabs were aware of the materials necessary to create glass ware, and he was certain it was not the usual glass material. Chinese porcelain reached its highest refinement during the Song Dynasty (960- 1279). While the city of Jingdezhen has been an important ceramic production center since the early Han Dynasty, in 1004, Jingde established the city as the main production hub for Imperial porcelain. During the Song and Yuan dynasties, porcelain made in the city and other southern China kiln sites used crushed and refined porcelain stones alone. The five greatest Song porcelains were ivory-white ding (ting) ware from Hebei Province, elegant blue ru (ju) ware from Henan, the transmuted jun (chun) style from Henan, crackled ge (ke or ko) porcelain from Zhejiang, and delicate blackwares from the imperial kilns at Huangzhou. During the reign of the Song Emperor Huizong (1100 – 1126), five famous kilns produced some of the finest and most treasured Chinese porcelain. Emperor Huizong personally supervised porcelain production at the Guan, Ru and Jun kilns; the other two were the Ge and Ding kilns. The origins of China’s crackled glaze porcelains are attributed to this period. An accident during the firing of a Jun kiln caused it to remain closed until the kiln had cooled down. When the artisans opened the kiln, they heard cracking sounds and expected to find all the pottery broken. Instead, the pieces were intact, and the glaze surface was full of cracks but smooth to the touch, producing a pleasing ring when tapped. The best-known Yuan Dynasty (1279 – 1368) porcelains include blue-and-white qinqhua and the deep color of the youlihong, tinted with red underglaze. During the Ming Dynasty (1368 – 1644) Jingdezhen became the main production center for large-scale porcelain exports to Europe, starting with the reign of the Wanli emperor, from 1572 to 1620. By this time china clay and porcelain stone were mixed in more-or-less equal proportions. China clay produced wares of great strength when added to the body layer. Whiteness became a much sought after property, especially when glazed to form blue-and-white wares. Porcelain stone was used with lower firing temperatures of 1250°C, compared to the mixture with china clay, which required 1350°C. The large southern egg-shaped kiln varied greatly in temperature; the temperature was hottest near the firebox and coolest near the chimney, at the opposite end of the kiln. Porcelain production in Jingdezhen became highly specialized, with teams of workers assigned to each aspect of production, and large kilns were built on the hillsides around the city, where thousands of pieces could be fired at once. Master craftsmen from all over China moved to Jingdezhen, attracted by its reputation for fine pottery. During the late Ming Dynasty, bright colors including deep red, ruby, jade green, bright yellow and peacock blue came into use, and techniques for underglaze painting were perfected. Enamel glazes, glazes over carved coatings, and combinations of painting and carving were used. During the Qing Dynasty, artisans developed new colors such as famille rose and famille verte, which were sued to create a three-dimensional appearance. During the nineteenth century, designs became very elaborate, with enamel and gold lines covering entire objects. Nothing but my curiosity could ever have prompted me to such researches, but it appears to me that a minute description of all that concerns this kind of work might, somehow, be useful in Europe. In 1743, during the reign of the Qianlong Emperor, Tang Ying, the imperial supervisor in the city produced a memoir entitled "Twenty illustrations of the manufacture of porcelain." Unfortunately, the original illustrations have been lost, but the text of the memoir is still accessible. "Sancai" means three-colors. 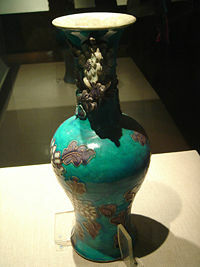 However, the colors of the glazes used to decorate the wares of the Tang dynasty were not limited to three in number. In the West, Tang sancai wares were sometimes referred to as egg-and-spinach by dealers for their use of green, yellow and white, though yellow might be more properly described as amber and white as off-white or cream. 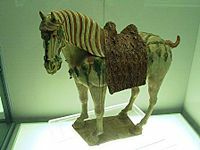 Sancai wares were northern wares made using white and buff-firing secondary kaolins and fire clays  At kiln sites located at Tongchuan, Neiqui county in Hebei and Gongxian in Henan , the clays used for burial wares were similar to those used by Tang potters. The burial wares were fired at a lower temperature than contemporaneous whitewares. Burial wares, such as the well-known representations of camels and horses, were cast in sections, in molds with the parts joined together using clay slip. In some cases, a degree of individuality was imparted to the assembled figurines by hand-carving. Jian blackwares, mainly comprising tea wares, were made at kilns located in Jianyang of Fujian province. They reached the peak of their popularity during the Song dynasty. The wares were made using local, iron-rich clays and fired in an oxidizing atmosphere at temperatures in the region of 1300°C. The glaze was made using clay similar to that used for forming the body, but fluxed with wood-ash. At high temperatures, the molten glaze separated to produce a pattern called hare's fur. When Jian wares were set a tilt for firing, drips ran down the side, creating evidence of liquid glaze pooling. 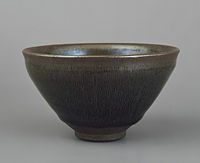 The hare's fur Jian tea bowl illustrated is in the Metropolitan Museum of Art in New York. It was made during the Song dynasty (960 to 1279 C.E.) and exhibits the typical pooling, or thickening, of the glaze near the bottom. The hare's fur patterning in the glaze of this bowl resulted from the random effect of phase separation during early cooling in the kiln and is unique to this bowl. No two bowls have identical patterning. The bowl also has a dark brown iron-foot which is typical of this style. It would have been fired, probably with several thousand other pieces, each in its own stackable saggar (a lidded ceramic box intended to protect the piece from kiln debris, smoke and cinders during firing), in a single-firing in a large dragon kiln. One such kiln, built on the side of a steep hill, was almost 150 meters in length, though most Jian dragon kilns were fewer than 100 meters in length. Tea is of light colour and looks best in black cups. The cups made at Jianyang are bluish-black in color, marked like the fur of a hare. Being of rather thick fabric they retain the heat, so that when once warmed through they cool very slowly, and they are additionally valued on this account. None of the cups produced at other places can rival these. Blue and white cups are not used by those who give tea-tasting parties. .
Jian tea wares of the Song dynasty were greatly appreciated and copied in Japan, where they were known as tenmoku wares. Phase separation in the iron-rich glazes of Chinese blackwares was also used to produce the well-known oil-spot, teadust and partridge-feather glaze effects. Qingbai wares were made at Jingdezhen and at many other southern kilns from the time of the Northern Song Dynasty until they were eclipsed in the fourteenth century by underglaze-decorated blue and white wares. Qingbai in Chinese literally means "clear white." The qingbai glaze is a porcelain glaze, so-called because it was made using porcelain stone. The qingbai glaze is clear, but contains iron in small amounts. When applied over a white porcelain body, the glaze produces a greenish-blue color that gives the glaze its name (qingbai in Chinese means greenish-blue). Some have incised or molded decorations. The Song dynasty qingbai bowl illustrated was likely made at the Jingdezhen village of Hutian, which was also the site of the Imperial kilns established in the year 1004. The bowl has incised decoration, possibly representing clouds or the reflection of clouds in the water. The body is white, translucent and has the texture of very-fine sugar, indicating that it was made using crushed and refined porcelain stone instead of porcelain stone and china clay. The glaze and the body of the bowl would have been fired together, in a saggar, possibly in a large wood-burning dragon-kiln or climbing-kiln, typical of southern kilns in the period. Many Song and Yuan qingbai bowls were fired upside down in special segmented saggars, a technique first developed at the Ding kilns in Hebei province. The rims of such wares were left unglazed but were often bound with bands of silver, copper or lead. 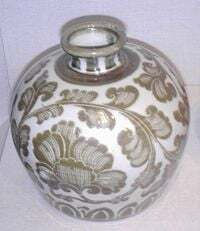 One remarkable example of qingbai porcelain is the so-called Fonthill Vase, described in a guide for Fonthill Abbey published in 1823: "…an oriental china bottle, superbly mounted, said to be the earliest known specimen of porcelain introduced into Europe." The vase was made at Jingdezhen, probably around the year 1300, and was sent as a present to Pope Benedict XII by one of the last Yuan emperors of China, in 1338. The mounts referred to in the 1823 description were of enameled silver-gilt and were added to the vase in Europe in 1381. An eighteenth-century water color of the vase complete with its mounts exists, but the mounts themselves were removed and lost in the nineteenth century. The vase is now in the National Museum of Ireland. It is often held that qingbai wares were not subject to the higher standards and regulations of the other porcelain wares, since they were made for everyday use. They were mass-produced, and received little attention from scholars and antiquarians. The Fonthill Vase, given by a Chinese emperor to a pope, might appear to cast at least some doubt on this view. Following in the tradition of earlier qingbai porcelains, blue-and-white wares are glazed using a transparent porcelain glaze. The blue decoration is painted onto the body of the porcelain before glazing, using very finely ground cobalt oxide mixed with water. After the decoration has been applied the pieces are glazed and fired. It is believed that underglaze blue-and-white porcelain was first made in the Tang Dynasty. Only three complete pieces of Tang blue and white porcelain are known to exist (in Singapore from the Indonesian Belitung shipwreck), but shards dating to the eighth or ninth century have been unearthed at Yangzhou in the Jiangsu province. It has been suggested that the shards originated from a kiln in the province of Henan. In 1957, excavations at the site of a pagoda in the province Zhejiang uncovered a Northern Song bowl decorated with underglaze blue, and further fragments have since been discovered at the same site. In 1970, a small fragment of a blue-and-white bowl, again dated to the eleventh century, was also excavated in the province of Zhejiang. In 1975, shards decorated with underglaze blue were excavated at a kiln site in Jiangxi and, in the same year, an underglaze blue and white urn was excavated from a tomb dated to the year 1319, in the province of Jiangsu. It is of interest to note that a Yuan funerary urn decorated with underglaze blue and underglaze red and dated 1338 is still in the Chinese taste, even though by this time the large-scale production of blue-and-white porcelain in the Yuan, Mongol taste had started its influence at Jingdezhen. Starting early in the fourteenth century, blue-and-white porcelain rapidly became the main product of Jingdezhen, reaching the height of its technical excellence during the later years of the reign of the Kangxi Emperor and continuing in present times to be an important product of the city. The tea caddy illustrated shows many of the characteristics of blue-and-white porcelain produced during the Kangxi period. The translucent body showing through the clear glaze is of great whiteness and the cobalt decoration, applied in many layers, has a fine blue hue. The decoration, a sage in a landscape of lakes and mountains with blazed rocks, is typical of the period. The porcelain body is finely textured, indicating the presence of a significant portion of china clay in the paste. The piece would have been fired in a saggar in a reducing atmosphere in a wood-burning egg-shaped kiln, at a temperature approaching 1350°C. 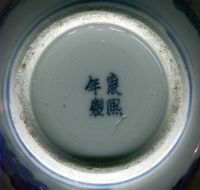 Kangxi reign mark on a piece of late nineteenth century blue and white porcelain. Italian pottery of the mid-fifteenth century shows heavy influences from Chinese ceramics. A Sancai ("Three colors") plate (left), and a Ming-type blue-and-white vase (right), made in Northern Italy, mid-fifteenth century. Musée du Louvre. Chinese potters have a long tradition of borrowing design and decorative features from earlier wares. While these ceramics with borrowed features might sometimes pose problems of provenance, they would not generally be regarded as either reproductions or fakes. However, fakes and reproductions have also been made at many times during the long history of Chinese ceramics, and continue to be made today in ever-increasing numbers. Reproductions of Song dynasty Longquan celadon wares were made at Jingdezhen in the early eighteenth century, but outright fakes were also made using special clay, and were artificially aged by boiling in meat broth, refiring and storage in sewers. Père d'Entrecolles records that by this means the wares could be passed off as being hundreds of years old. At Jingdezhen the two remaining wood-fired, egg-shaped kilns produce convincing reproductions of earlier wares. At Zhejiang province, good reproductions of Song Longquan celedon wares continue to be made in large, side-stoked dragon kilns. Before World War II, the English potter Bernard Leach found what he took to be genuine Song dynasty cizhou rice-bowls being sold for very little money on the dock of a Chinese port and was surprised to learn that they were in fact newly made. In modern times the market for Song dynasty Jian tea-bowls has been severely depressed by the appearance in large numbers of modern fakes good enough to deceive even expert collectors. It is reported that some of these fakes show evidence of having had genuine Song dynasty iron-foot bases grafted onto newly made bodies. In the late nineteenth century, fakes of Kangxi period famille noire wares were made that were convincing enough to deceive the experts of the day. Many such pieces may still be seen in museums today, as may pieces of genuine Kangxi porcelain decorated in the late nineteenth century with famille noire enamels. A body of modern expert opinion holds that porcelain decorated with famille noire enamels was not made at all during the Kangxi period, though this view is disputed . A fashion for Kangxi period (1662 to 1722) blue-and-white wares grew to large proportions in Europe during the later years of the nineteenth century and triggered the production at Jingdezhen of large quantities of porcelain wares that bear a resemblance to ceramics of earlier periods. Such blue-and-white wares were not fakes or even convincing reproductions, even though some pieces carried four-character Kangxi reign-marks that continue to cause confusion to this day. Kangxi reign-marks in the form shown in the illustration occur only on wares made towards the end of the nineteenth century or later, without exception. The most widely-known test for authenticating Chinese porcelain is the thermoluminescence test, or TL test, which is used on some types of ceramic to estimate, roughly, the date of last firing. The TL test is carried out on small samples of porcelain drilled or cut from the body of a piece, at the risk of damaging or disfiguring a piece. For this reason, the test is rarely used for dating finely-potted, high-fired ceramics. TL testing cannot be used at all on some types of porcelain items, particularly high-fired vitreous porcelain. Vase, Eastern Zhou, 4th-3rd century B.C.E. British Museum. Ru ware stand for a wine cup, made for the imperial court. Victoria and Albert Museum, London. A porcelain teapot in Qingbai Style, from Jingdezhen. Funerary vase and cover, green-glazed stoneware. Longquan, Zhejiang province, Northern Song dynasty. 10th or 11th century C.E. Collection Yuegutang, Berlin; Museum für Ostasiatische Kunst, Berlin-Dahlem. A celadon shoulder pot from the late Yuan Dynasty, displaying artwork of peaches, lotuses, peonies, willows, and palms. Decorating porcelain at modern-day Jingdezhen. ↑ Rose Kerr, and Nigel Wood, (2004). Science and Civilization in China, Vol. 5, Part XII: Ceramic Technology. (Cambridge University Press. ISBN 0521838339). ↑ S. W. Bushell, (1906). Chinese Art. (Victoria and Albert Museum Art Handbook, London: His Majesty's Stationery Office). ↑ 12.0 12.1 Two letters written by Père Francois Xavier d'Entrecolles. at Ceramics Today.com. Retrieved December 16, 2007. ↑ Tang Ying's "Twenty illustrations of the manufacture of porcelain." at the Seattle Art Museum. Retrieved December 16, 2007. ↑ 14.0 14.1 Nigel Wood (1999). Chinese Glazes. (London: A.C. Black. ISBN 0713638370). Bushell, S. W. (1906). Chinese Art. London: Victoria and Albert Museum Art Handbook, His Majesty's Stationery Office. Bushell, S. W. (1977). Chinese Pottery and Porcelain. Kuala Lumpur: Oxford University Press. ISBN 0195803728. Kerr, Rose and Nigel Wood (2004). Science and Civilization in China, Vol 5, Part XII: Ceramic Technology. Cambridge University Press. ISBN 0521838339. Kotz, Suzanne, ed. (1989). Imperial Taste. Chinese Ceramics from the Percival David Foundation. San Francisco: Chronicle Books. ISBN 0877016127. Li, He. (1996). Chinese Ceramics. The New Standard Guide. London ; New York: Thames and Hudson. ISBN 0500237271. Pierson, Stacey, (1996). Earth, Fire and Water: Chinese Ceramic Technology. Percival David Foundation of Chinese Art, University of London. ISBN 0728602652. Wood, Nigel (1999). Chinese Glazes. London: A.C. Black. ISBN 0713638370. This page was last modified on 9 June 2008, at 16:12.